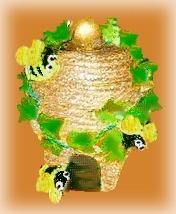 The honey inside a beehive symbolizes the fruits of hard labor, so what could be more fitting as a trinket holder for your treasures than this clay pot beehive, made from a clay pot and saucer, string and cute little bumble bees. 1. Beginning at the outside bottom of the terra cotta saucer, take the tip of the rope and hot glue it to the center of the saucer. Continue hot gluing the rope, going around and around, until you reach the end at the lip of the saucer. 2. If using a wooden ball as the top handle, paint it gold and let dry. Glue the ball to the top center of the saucer. 3. Begin hot gluing rope around the clay pot, just as you did with the saucer, starting at the center bottom and ending at the top of the pot lip. 4. Optional: paint the entire pot and lid with clear glitter paint. 5. Paint an opening on the beehive, using black paint, at the bottom of the clay pot. See photo for placement details. 6. Ivy String: We crocheted two strings of green crochet thread to form the base for the ivy leaves strung around the pot. Glue one string to the saucer (now the beehive lid) and one around the clay pot (now the beehive base). Hot glue ivy leaves around the two strings, using leaves left over from other crafts or cut leaves from an ivy pick. Note: You may be able to use pieces of an ivy garland, or something similar, instead of making your own ivy string. Just check the photo for an idea of the finished effect and use the supplies you have and your imagination to achieve the look you want. 7. Glue on several artificial bees, making sure there is at least one bee on the lid and two on the clay pot.